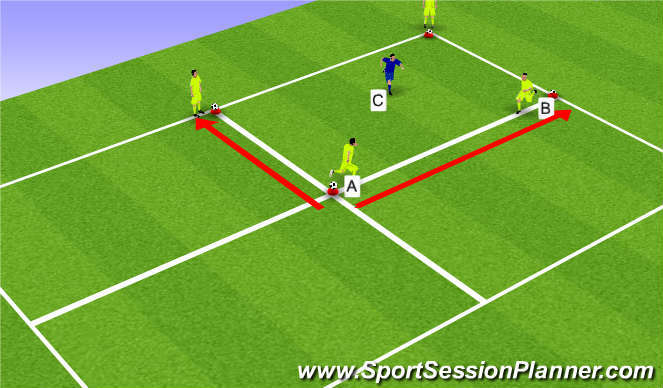 - Players can Switch Cones/Positions with any of their two partners to their Left and Right (As Highlighted above) Not Diagonal, But ensring both players make the movement similtaneously. - Player C&apos;s role is to remove himself from the middle. 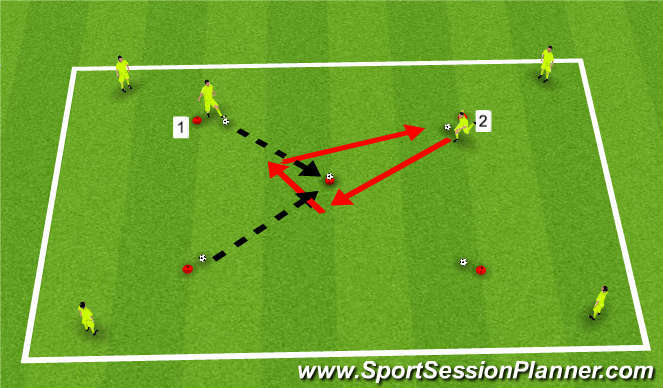 - To do this, Central Player (Player C) is Scanning and aware of Outside Players movement and when outside players look to Switch, simply beats an Outside Player to their cone of their Choice, Allowing Players to rotate, roles and responsibilities. Progression - Once Players become used to movement patterns and understand of game, look to introduce Balls; and players now have to Dribble/Run the ball across during &apos;Switch&apos;, Once Again depending on Age/Ability, Players can &apos;Switch&apos; balls during movement; Defender can also be provided with a Ball, Once again on the Coaches preference. Look at Key Players Movement, Communicational Aspects of the Game, Manipulation of Ball and Ability to work as a Four. Length of Warm-up, 10-15 minutes. Small Groups to support Rotation, Identified &apos;Active Player&apos; near cone, Server/Receiver behind to &apos;Serve or Collect&apos; ball for smooth Transition. - Three Balls, Placed upon Three Cones, 10-yards away (Increase/Reduce Distance) depending upon Age and Ability of Players. 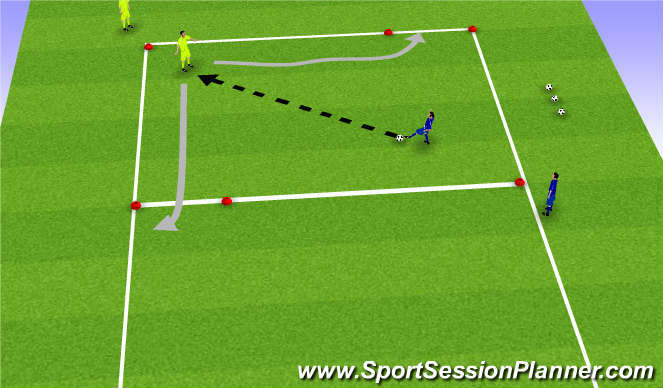 - Aim of Session to remove ball (Knock-down) from Cones via specific chosen activity. - Players can Pass (Variety of Striking Techniques) Ball, Roll Ball, Etc..
- If Players knocks ball off cone, receivers role to replace ball and complete change-over. - Three Balls, Placed upon Three Cones, 6-yards away (Increase/Reduce Distance) depending upon Age and Ability of Players. 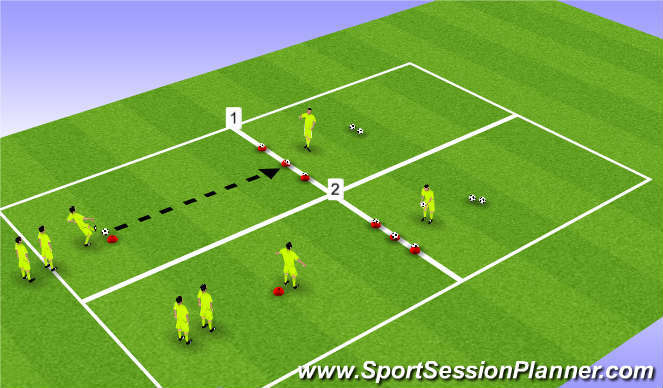 - Heading Exercise; Depending upon Players ability, can serve ball for them selves or (as pictured) ball can be served from receiver behind targeted cones. Square set-up, 20x20 Area, with two Starter Cones diagonally apposite one another and remaining two-corners supported with a target (3-5 yards) apart, creating a gate/goal for the attacker (Yellow) to attack/attempt to score within. - Players, with balls start off activity, by moving ball into centre of the grid and passing the ball across to the awaiting players. - Once, the player recieves the ball, aim/challenge is to dribble/move with ball, between targeted gates and run the ball through to end practice. (Challenge for the player, in possession to move the ball into identified space (towards the gate) and dictate/judge if there is a requirement to change direction (turn) and move ball towards 2nd Gate, if space is closed off by defender. - Rotation (Depending upon age and ability) once players complete activity, they can either return back to their cones (easy understanding) or rotate cones. Large Square (25x25) distance, with players evenly divided around group, upon the four cones. All Players upon cones provided with a number and await coaches instructions from 5-yards behind cone were the ball is allocated. - Coach to communicate a number, on coaches call, all four players who match information provided by coach (one per group) to rise and address ball in-front of them and within their allocated corner. - As, they address ball, aim of the game, is to &apos;knock-down&apos; strike, Tower (Ball and Cone) within centre of the group to succesfully complete action.